I adapted this recipe to remove the oil and cut down on the coconut milk, and I replaced the green beans the recipe called for with chickpeas. My family really loved this quick and easy dish. Note about the coconut milk: I didn’t have 2 cups, and I wouldn’t use that much even if I did have it. I cut the fat by using the coconut milk I had, about 1 cup, and filling out the rest with soymilk, water, and a splash of coconut extract. You can use as much or as little coconut milk as you want. See the substitutes page for more information. Heat 1 tablespoon of water in the pressure cooker. Cook the garlic over medium- high heat, stirring constantly, for about a minute. Add the coconut milk, soy sauce, lemongrass, dried basil, spices, red pepper flakes, reserved broccoli stalks, sweet potatoes, and mushrooms. Lock the lid in place. Over high heat, bring to high pressure. Lower the heat just enough to maintain high pressure and cook for 2 minutes. Reduce the pressure with a quick release method. Remove the lid, tilting it away from you to allow any excess steam to escape. 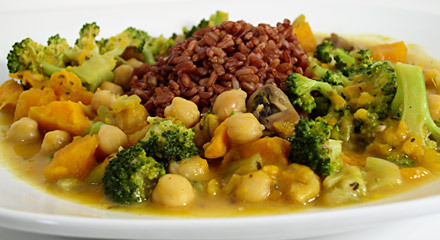 Stir in the broccoli florets and chickpeas. Replace (but do not lock) the lid and cook over medium heat until broccoli is tender-crisp, 3 to 4 minutes. Stir in the fresh basil (if using) just before serving. I served it over red brown rice, which I found in an Asian supermarket. You can serve it over any grain you want, or just eat it out of a soup bowl. The potatoes break down slightly and form a delicious sauce with the coconut milk. Stacy, I would either leave it out or add a little lemon zest at the end. Susan, I’ve made this recipe before, with fresh lemongrass from my CSA, and loved it. I was hoping to make it again for dinner tonight. Problem is, my grocery store is out of fresh lemongrass. I also can’t locate dried lemongrass anywhere. Would it be okay to leave out the lemongrass or do I need to wait until I can order some online? (And if so, do you have a recommendation on a good quality ground lemongrass to order?) Thank you so much!! If you are concerned about the fat in coconut milk, you could always use the So Delicious Unsweetened Coconut Milk. Containing only 50 calories & 5 grams of fat in one cup, it is much lower in fat & calories than the canned varieties of coconut milk are. Thank you Linda Middlesworth for sharing truth about proper diet for diabetes. Another excellent resource on this topic can be found at Dr.John McDougall’s website http://www.drmcdougall.com. Again, the prevention and cure of most diseases and illnesses comes from consuming a whole foods, high complex carb plant based diet. Susan — This was awesome! I would have never thought to put broccoli and sweet potatoes together, but it totally worked. I threw in some spinach at the end since I had it on hand and it blended in nicely. This recipe is a keeper. I ADORE this website!!! It has been a life changing find for me and my family. We are eating better and with more joy than ever before. THANK YOU for helping enrich our lives with your time and talents. I will be coming back weekly!!! Dear people with diabetes: you do not need to watch carbs! The best way to reverse diabetes is to eat complex carbs and NO animal fat saturated from animal flesh or secretions! Get Dr. Neal Barnard: Reversing Diabetes. My clients always reverse diabetes by going low fat plant based! The CARB myth is still out there…oh vey! i’d also like to add a big thanks to Susan for these very conscientious recipes- I am also impressed with the wealth of nutrition information and full disclosures of every recipe. I’ve been browsing this website for a few weeks and made a few tasty recipes, and I must say, it has completely transformed how i view food and I now more than ever believe that there are a lot of ingredients in food that simply don’t need to be there for a tasty meal. Susan, I appreciate all that you do and the clarity with which you do it! Thanks and I hope to continue to enjoy many more wonderful meals based on your inspiration. Kudos! All foods contain fat (except for water). Broccoli is 10% calories from fat. Romaine lettuce is 14.7% calories from fat. There is no such thing as a fat-free food, and the 15% guideline is low by most standards (the American Heart Association) and right in line with others (the McDougall program). This site uses the common definition of fat-free, which is posted on the FAQ’s page: No oil or margarine, no animal products, and preferably no high fat vegetable foods (nuts, seeds, avocado, or coconut). The complete definition is there in the FAQs and has been for years. “Less than 15% of calories from fat” is not fat free. Fat free is 0% of calories from fat. So, yes – “many” of your recipes contain fat. They may not be high fat and they may still be very healthy but they are not fat free recipes. So, you should expect some comments about that and may want to rethink telling readers they are being “snippy” for pointing out an obvious contradiction between your blog moniker and the content. I really enjoy your blog and have tried several of your recipes. They are tasty! As the recipe says, you can use soy milk with a splash of coconut extract to replace the coconut milk. No need to get snippy. Alot of these recipes are not Fat-free or even low Fat. Coconut milk is HIGH in fat. It’s not totally bad but some of use are really watching our fat. This website should have an “Add to My Recipes” button. Becky – If you join livestrong.com there is an application called “daily plate.” It allows you to create “recipes” and tell you exact nutrition per serving. It’s amazing!!! I wish so too! But since all the recipes are reader-submitted, we have to rely on what people say in their recipes (which may or may not be correct). An easy solution is to get a low-cost recipe program like Living Cookbook and enter any interesting recipes yourself. Most of them have ways to import recipes from web pages, and you could then verify for yourself that the info is accurate. These recipes all sound delicious, but my husband has to watch his carbs due to diabetes. I am always watching my calories, having recently lost 110 pounds. I wish this website published carb and calorie counts for all of their recipes. This one should be fairly easy to do without a pressure cooker. The only long-cooking ingredient is the sweet potato, so just follow the directions, and when it calls for cooking under pressure for two minutes, just cover your pot and cook on medium heat until the sweet potato is tender. Then follow the rest of the instructions. This looks wonderful but I do notr have a pressure cooker. How can I make this with a stovetop pot?